Lawrence R. Paletz, MD is a founding member of West Coast Urology (Paletz Agatstein Urology Medical Group, Inc.). Dr. Paletz did his undergraduate work at the University of Southern California and received his medical degree from Universidad Autonoma de Guadalajara. His post-graduate training included a surgical internship at Martin Luther King General Hospital, Los Angeles, a urology residency at White Memorial Medical Center, Los Angeles and a fellowship in pediatric urology at Children’s Hospital, Los Angeles. Board-certified and Board-recertified by the American Board of Urology, Dr. Paletz has received special certification and training in various areas of urology including Microwave thermotherapy and laser surgery. A member of the American Urological Association, Dr. Paletz is also a member of the Association of Professional Team Physicians and has worked with individual team members of the Los Angeles Lakers and Los Angeles Dodgers. 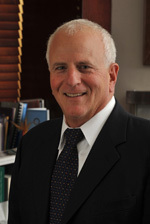 His reputation for medical excellence has led to his serving in several executive management positions including as the former Chief of Staff of Centinela Hospital and as Chairman of the Board of Centinela Freeman Health Systems.